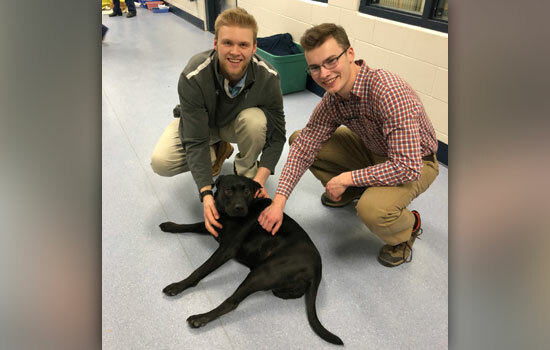 Sean Bellefeuille, left, and Will Byron, right, pose with Molly, a black lab they are creating an assistive device for. Sean Bellefeuille, a third-year biomedical engineering student, helped establish a new club on campus called BioPrint. Bellefeuille, the founding president, and his friend Will Byron, a second-year biomedical engineering student and the founding vice president, were interested in creating more opportunities to experiment with 3D technologies in the realm of medicine. This spring is their first full semester and they’ve already started working on several different projects as a club. BioPrint is a project-based club and they don’t hold weekly meetings as a club, but students will meet with their project teams regularly so they can progress in the project and report back to the club periodically. Based in the Department of Biomedical Engineering, BioPrint is just one of many ways that students are applying what they learn to projects they are passionate about. To learn more about BioPrint, visit its website and Facebook page. For information about joining, reach out to the club at bioprint@rit.edu. Question: What is the BioPrint club? Answer: RIT BioPrint is a club that explores 3D technologies in the medical field. The applications of this technology can be anything from prosthetics to assistive devices, to surgical models and other things like that. We use today’s technology to create something that will help someone in the medical field, for both animals and humans. As a club, we have two pillars: teach and do. For the first pillar, we have a lot of workshops where we teach younger students the programs we are working with, which is helpful for when they look for co-ops. The second pillar is fulfilled with the projects where we use what we learn and do something with it. We usually do one or two workshops a month, and we work on the projects every week. Q: Why did BioPrint choose to work on projects for both humans and animalsTell me about your projects working with the local veterinary offices? A: The animal side is one of my personal interests, so I really pushed for that. We have quite a few resources in Rochester for the animal aspect, like Lollipop Farm and the Veterinary Specialists & Emergency Service hospital in Henrietta. I looked into a couple different possibilities and found that they wanted our help and wanted to work with us. We got two projects from that effort and the help of our department. Will (Byron) is more interested in the human side of this technology. He did his own outreach and that’s where we got one of our other projects, working with a local amputee. Q: How did these collaborations happen? A: The first project we did before the club officially started was with Dr. Daniel Hoffmann, the head of surgery at the Veterinary Specialists & Emergency Service. He reached out to the biomedical engineering department head Dr. (Steven) Day to ask if anyone would be able to create a surgical model for him. He wanted to plan the surgery better, because it was a difficult case and he couldn’t visualize it well. We had actually never done anything like this, and he asked us to get it done in a week, but we still agreed to work on the project. After this project went well, the same doctor came to us with a new project that he needed help with and we, obviously, accepted. Our work with Lollypop Farm started with Cristina Cadavieco, the head of Veterinary Medicine at Lollypop. We got involved with them after I sent them an email explaining who we were and what we did and told them if they were interested in our services to just let us know. I actually got an email back two days later saying they just received a black lab that had a prior amputation and later got hit by a car, fracturing the hip of the remaining back leg. They asked us if there was anything we could do, and we told them we were interested and would do our best. They were actually going to put Molly, the dog, down, but after reading our email and talking with us they decided they were going to keep her alive and see if we could create a device for her. Q: In your opinion, what impact do you think this technology can have on the veterinary and medical fields? A: I think it can have a great and positive impact on it. There are just so many opportunities to learn about different things with 3D technology and how to apply it in ways you’ve never even thought of. In terms of personalized medicine, I think this technology would really help. Customizing things for different people, like making a model for surgery that is specific to the patient, is amazing. It’s something that will really help surgeons. There’s a lot of technology out there and there are so many ways of exploring it, people just don’t know because they haven’t tried. A: We are working on six projects right now and each one has a leader. We are working on two projects with the Veterinary Specialists & Emergency Service and Lollypop, which I’m leading. 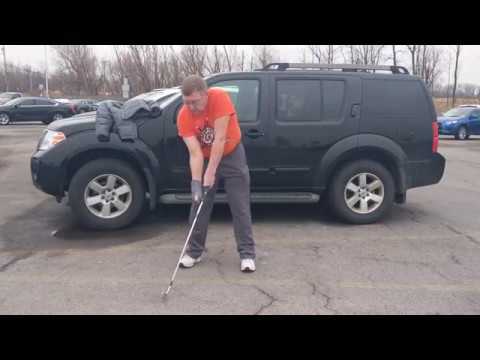 We have another project called Golfer Gary, which is working with an older man who lost eight of his fingers after being put into a medically induced coma. He loves to play golf and, despite his amputations, he still wants to play. So, we developed a prototype of a new assistive device that will hopefully make golfing easier and more comfortable for him. He’s in Florida testing it now and will give us feedback when he returns. Another project we are working on is the RIT Arm. We have two teams working on specific components dealing with enhancing the mobility of a previously developed device. The other two are more technology based and don’t directly involve a patient. One is called Hack-a-Kinect. Mostly computing majors worked on this, and they were working with an Xbox Kinect to try to use the device to create a scanner. The last project is called Printer Refurb. We have a couple of old 3D printers that we are trying to fix up to see if we can get them working again. It’s a great opportunity to learn about how the printers work, because the printers break down a lot and being able to know how to fix them is really important and a good skill to have. Q: Who can get involved with the club? A: Anyone can join the BioPrint club. There are so many different kinds of students involved. We have liberal arts students, engineering students, health science students. We have all kinds of people and we accept everyone. If you’re interested in something and you have a skill that can be used to help us with the medical technology, we will find a job for you.